Following a diet with plant-based foods is your healthiest option and can help you lose weight, according to the Harvard School of Public Health. Adding green juice to a nutritious food and exercise plan will help you get essential fiber, antioxidants, vitamins and minerals. However, the types of green juices you consume make a considerable difference in your weight-loss efforts. If you have health concerns, speak with your doctor before implementing a diet plan. Choose your green juices carefully. Packaged, processed or dehydrated juices and juice mixes typically have added sodium, flavor syrup or sweeteners that add calories and make them less nutritious. Make your own juice for the best results. 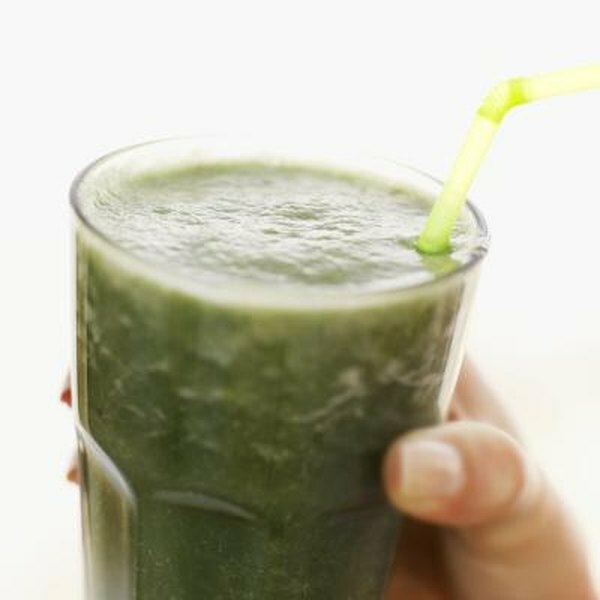 Blend together frozen banana chunks and spinach for a smooth-textured green smoothie. Use fiber-filled leafy greens like kale and flavorful carrots for a nutrient-dense juice that fills you up so you have less inclination to snack on fattening foods, helping you to lose weight. For added fiber and nutrients, add a small scoop of unsweetened wheat germ or toasted amaranth to your juice blend. Even green juices and other healthful foods can make you gain weight if you do not watch your portion sizes. Juices made of only vegetables and water will typically have the fewest calories. However, add yogurt, cereal, nuts or seeds to your juice blend and you also add considerable calories. Measure your toppings and add-ins to keep your green juice diet calorie-controlled. If you want to lose about 2 lbs. per week, limit your daily calories to 1,600 to 1,800 calories. Women of average stature should consume on the lower end of the scale, while men of average stature can consume on the higher end of the scale. Keep your green juice diet nutritious and interesting by varying the ingredients. Spike a green juice with fiber-filled pineapple chunks for a tinge of sweetness. Add fresh herbs to your juice, like a limeade with mint, for variety. The more diverse your overall diet, the more likely you will consume essential nutrients. Balance your green juice diet with meals consisting of fresh, whole, plant-based foods like seeds, lentils, peas, unsweetened nuts, unsweetened whole grains and heart-healthy fats like avocado, olives and olive oil. Whenever possible, make your green juices from fresh, local produce. Organic or seasonal produce are good options, maximizing the flavor of your beverages. Avoid additives such as agave nectar, honey or other sweeteners which are high in calories. Sweeten your juice naturally with a splash of fresh orange juice, chopped apples or a handful of berries. Season your green beverages with cinnamon, vanilla or other spices.